The LJTick-Proto (LJTP) consists of an 8x8 grid of holes for prototyping custom signal-conditioning ticks. The 4-pin design plugs into the standard AIN/AIN/GND/VS screw terminal block found on LabJacks such as the U3, U6, and T7. 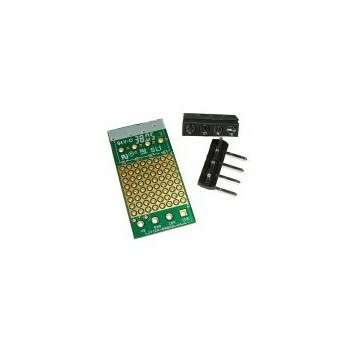 Includes 3 loose pieces: the pcb, a 4-position screw terminal, and a right-angle pin header. The LJTick-Proto (LJTP) consists of an 8x8 grid of holes for prototyping custom signal-conditioning ticks. The 4-pin design plugs into the standard IO/IO/GND/VS screw terminal block found on newer LabJacks such as the U3, U6, and UE9. 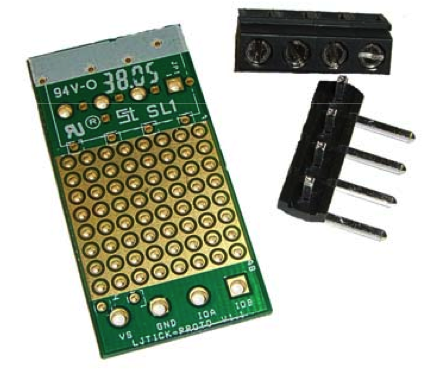 Includes 3 loose pieces: the PCB, a 4-position screw terminal, and a right-angle pin header. Besides the exceptions that follow, the LJTP consists of various unconnected holes. The user must provide the desired connections. Towards the bottom left of Figure 1 is the large VS hole. When the right-angle pin header is installed and used to plug the LJTP into a LabJack, this point will be VS. There are six small holes which are connected to the large VS hole. Two holes on the LabJack side of the 8x8 grid (towards bottom of Figure 1) and four holes on the other side of the 8x8 grid (towards top of Figure 1). Towards the bottom left of Figure 1 is the large GND hole. This GND hole is connected to the ground plane throughout the LJTP. There are 9 additional small holes at the other end of the LJTP which are also connected to ground. Besides the GND and VS holes, no other holes are connected to anything. The 8x8 grid of holes is surrounded on the top side by a plane connected to ground. This makes it easy to connect any of these holes to ground with a little blob of solder. Figures 2 and 3 show an example build-up of an LJTP. In this case the LJTP has been used to assemble a 2X output amplifier designed to convert 0-5 volt analog outputs to 0-10 volts. This uses the LT1490 op-amp to make a pair of non-inverting amplifier circuits with a gain of ~2. 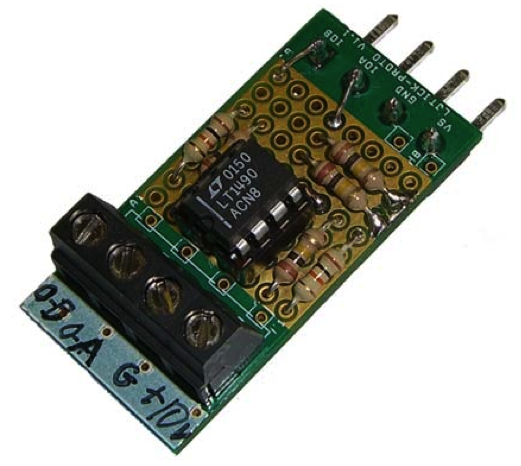 The terminal labeled “+10V” is used to provide a >10 volt supply to power the op-amp. Figure 3 also shows the various surface mount pads available on the LJTP. None of the pads are connected to anything.